The Qduino Mini is the first tiny Arduino-compatible board with a built-in battery charger and fuel gauge. 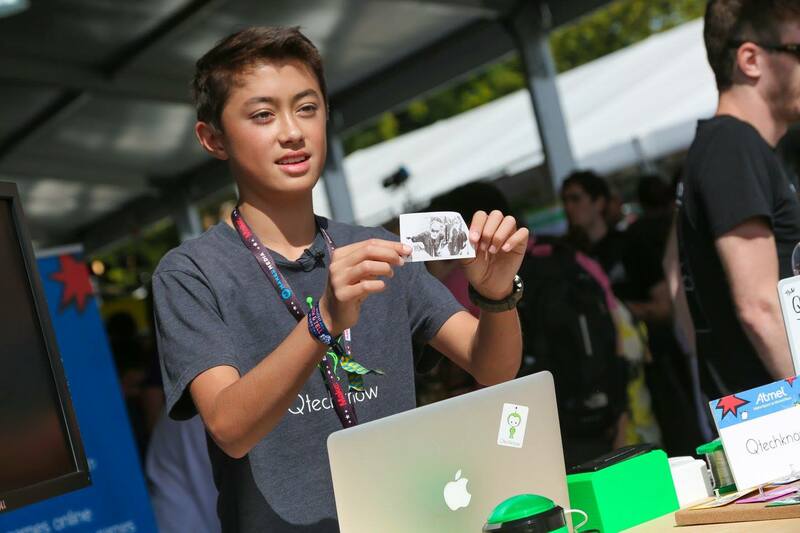 Adding to 15-year-old Quin Etnyre’s already rather long list of accomplishments was a successfully funded Kickstarter campaign back in March 2015. 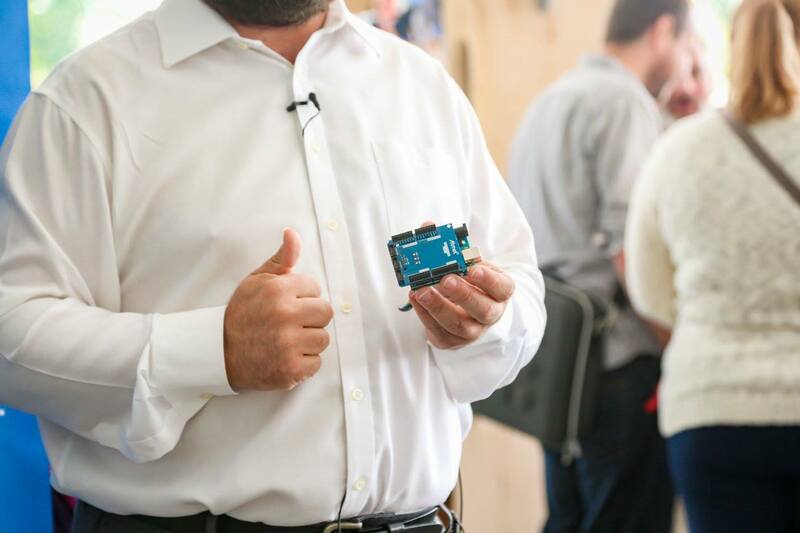 The Qduino Mini — which has been on display numerous times inside the Atmel Maker Faire booths — is the first tiny Arduino-compatible board equipped with a built-in battery charger and fuel gauge that can notify its user when a LiPo needs a little extra juice. 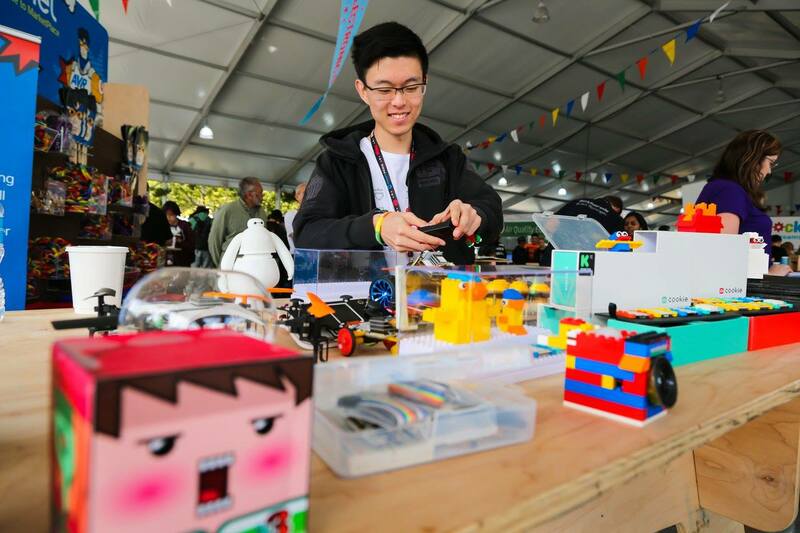 “I always struggled to find a way to charge and monitor a battery, bundle with an Arduino and fit inside of every project.” Inspired by his own frustrations, the young Maker immediately went on to prototype his concept with hopes of one day bringing it to market. Now available on SparkFun, the Qduino Mini is entirely open source and based on the versatile ATmega32U4 — the very same chip that can be found at the core of the Arduino Leonardo and several other Arduino AtHeart devices. The breadboard-friendly MCU runs at 8MHz at 3.3V and boasts plenty of dedicated digital, analog and PWM pins. 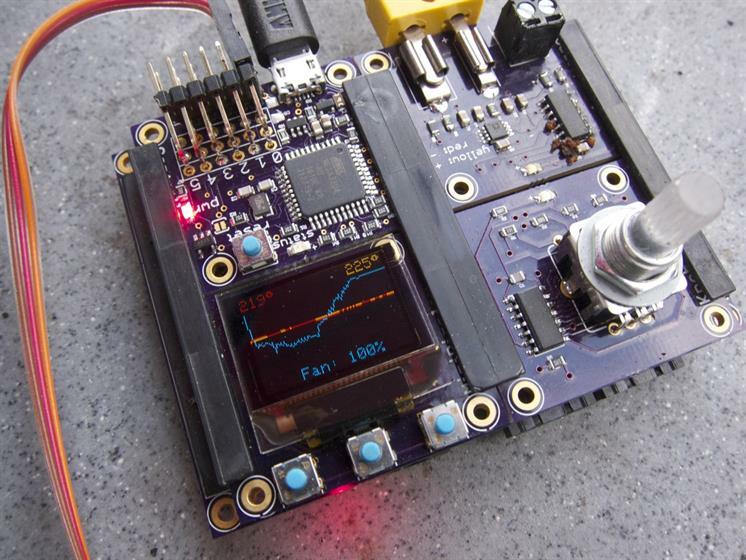 The pint-sized project is not only packed with a battery charger circuit and fuel gauge, but possesses an uber-mini, ultra-thin form factor as well. This makes the shrunken-down, lightweight ‘duino an ideal choice for DIY quadcopter or high-altitude balloon projects, in addition to a wide range of other gadgets like an NFC Smart Lock and B&W Selfie Printer. Since its inception, the Qduino Mini has received a few minor upgrades before arriving at its latest iteration. According to Quin, these included two RGB LEDs (one for status, another that’s user programmable), a USB and power switch on the same face, and a LiPo connector on the opposite side of the board. What’s more, it has become even more “mini,” having been reduced from its original 1″ x 1.5” size to 0.8″ x 1.5”. 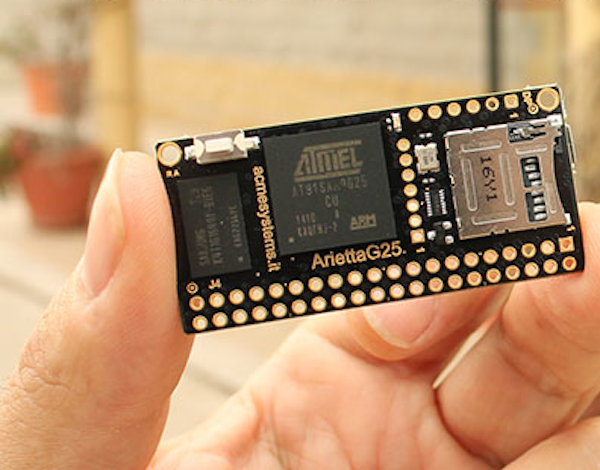 Sound like the tiny, Arduino-compatible board you’ve been looking for? Well, look no more as the Qduino Mini is available for $29.95 on SparkFun! This entry was posted in Arduino-Compatible, Boards & Platforms, Hardware, Maker Movement, Young Makers and tagged Arduino, Arduino-Compatible, ATmega32U4, Kickstarter, Maker Faire, Qduino Mini, Qtechknow, Quin Etnyre, SparkFun on January 18, 2016 by The Atmel Team. 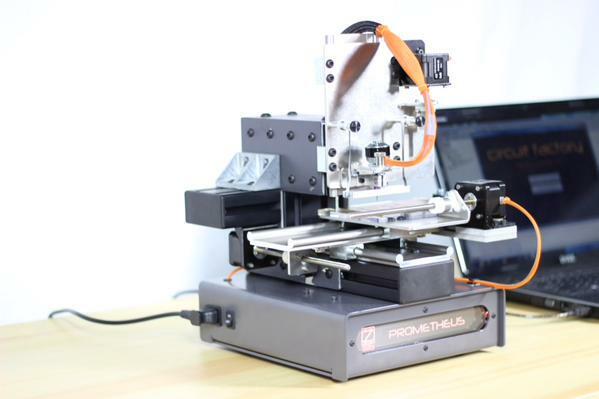 While it may look like a 3D printer, Prometheus is a PCB milling machine that carves, drills and shapes your PCBs so you don’t have to wait for a delivery truck. While open source hardware has dramatically reduced the time and cost associated with product development, there are still a few speed bumps that Makers and designers must endure en route to taking their idea from prototype to mass production. Looking to change that is Rocco Tuccio, who together with his Zippy Robotics team, has built a desktop machine that can create real circuit boards in a matter of minutes. Meet Prometheus. “When we’re prototyping, we need a tool that can give us nearly instant feedback — not feedback that comes in a few week’s time in the form of a PCB delivery. Let the PCB manufacturers make the hundreds or thousands of boards for your production run — not your prototypes. If production is your goal, Prometheus will help get you there faster,” Tuccio explains. Prometheus works by carving through the copper layer of a standard copper-clad board (FR-4 or FR-1). Essentially, it can be thought of as mechanically etching the PCB as opposed to dealing with chemicals to perform the etching. Prometheus can also drill holes and route the shape of the board itself if you need it to fit a specific enclosure. Surely the ongoing desktop fabrication revolution has yielded similar equipment, but what makes Prometheus stand out from others on the market is its unique spindle. This mechanical part’s incredible specs speak for themselves — 45,000 RPM and a static Total Indicated Runout (TIR) of less than 2.5 microns (.0001 inches), measured 10mm below the spindle bearing. “TIR is important because it determines the minimum bit diameter we can run. Too much runout (wobble) and a micro end mill will just snap instead of milling copper as intended. Prometheus can reliably run bits as small as .007 inches in diameter, so you can use (with few exceptions) any surface mount components in your designs — not just ‘giant’ SOIC packages. This is a major differentiator with what’s available in our price class today,” Tuccio adds. And they didn’t stop there, either. No other manufacturer makes a PCB milling machine and the design software to go with it. Zippy Robotics’ Circuit Factory program works seamlessly with Prometheus, enabling you to devise your schematic and board layout quickly and easily, even if you’ve never designed a PCB before. Once completed with your mockup on Circuit Factory, simply click the ‘carve’ button and Prometheus will take care of the rest. “It will allow a software developer to control Prometheus so that they can write their own apps to make particular tasks easy. They can then give those apps away or sell them, without restriction, to the benefit of all Prometheus users. You don’t have to know anything about G-code. G-code is a relic from the ’70s and it’s time we moved on to better things,” Tuccio explains. With its incredible XY resolution and its ability to mill out traces and spaces as fine as 0.007 inches from any standard copper-clad PCB material, Prometheus is arguably one of the most advanced gadgets in its class. These traits will put Zippy Robotics toe-to-toe with other professional grade machines out there, which keep in mind, cost more than $8,000. This unit’s price tag, however, is a fraction of that. Not only a great product, but an outstanding team behind it as well. We’ve had the pleasure of getting to know Tuccio and the New York-based startup for several years now, and have witnessed the progression of the desktop-friendly device — from its earlier and bulkier versions to its latest compact, commercial-ready form factor. Tired of waiting for delivery and rather have your own PCBs just a click away? Head over to Prometheus’ Kickstarter campaign, where the Zippy Robotics crew is currently seeking $95,000. Delivery is slated for sometime next fall. Trust us, it’ll be worth the wait! 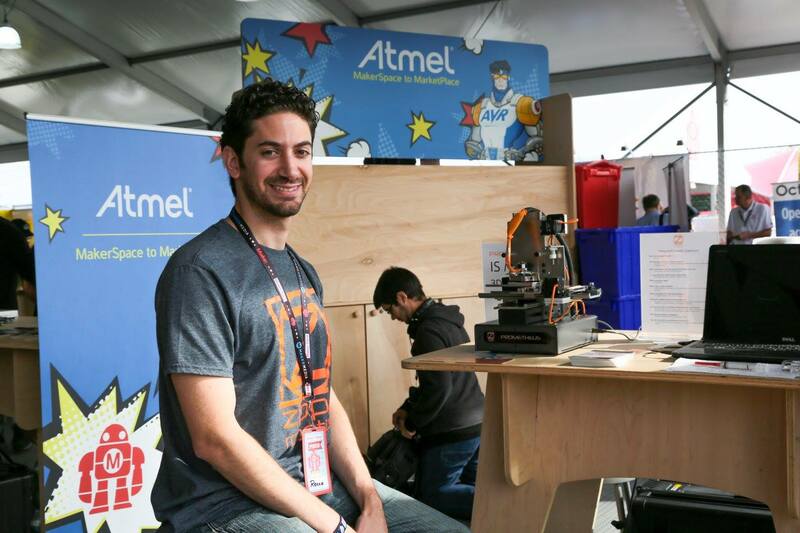 This entry was posted in Maker Movement, The Workbench and tagged Cortex-M4, Desktop PCB Machine, Kickstarter, Maker Faire, PCB, PCB Milling Machine, Prometheus, SAM4S, tag7, Zippy Robotics on November 16, 2015 by The Atmel Team. It seems like yesterday that we were at the New York Hall of Science preparing for what was surely an incredible World Maker Faire 2015. And now just a few weeks later, the Atmel crew has arrived in Rome, all set to kick things off at the Sapienza University campus. Acme Systems designs and manufactures Linux-embedded boards, namely the Arietta G25 system-on-module with an Atmel AT91SAM9G25 at its core. One project in particular that you’ll want to check out is the team’s open source LED panel that interacts with a smartphone over Wi-Fi. 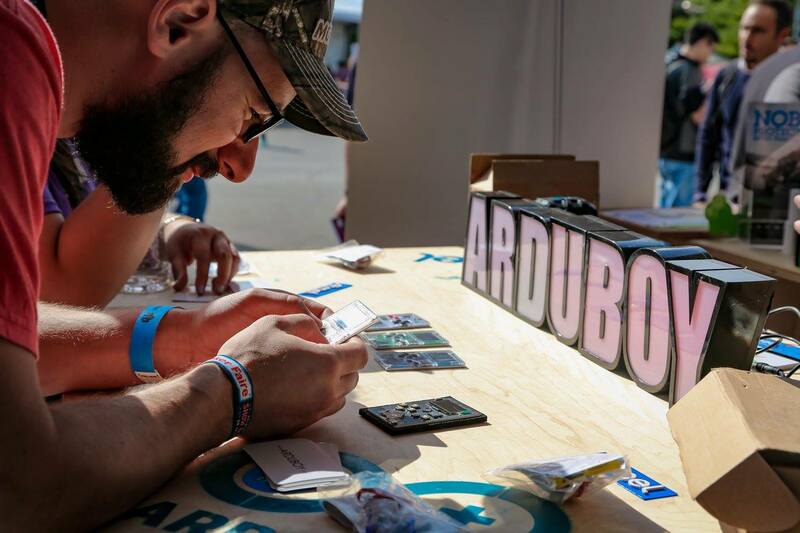 A crowd favorite back at World Maker Faire, Arduboy is an open source, credit card-sized console that lets people play, create and share their favorite 8-bit games. 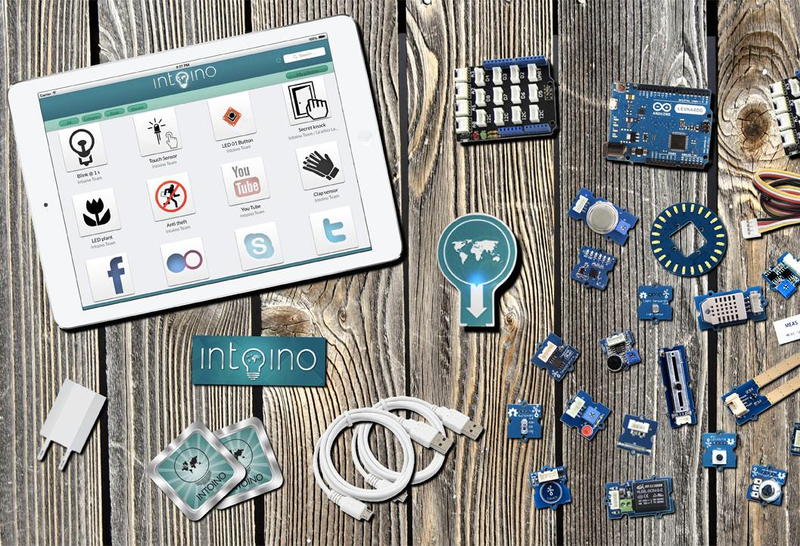 As seen on Indiegogo, Intoino‘s KITS provide a simple way for young Makers to learn coding and electronics while bringing their connected projects to life. 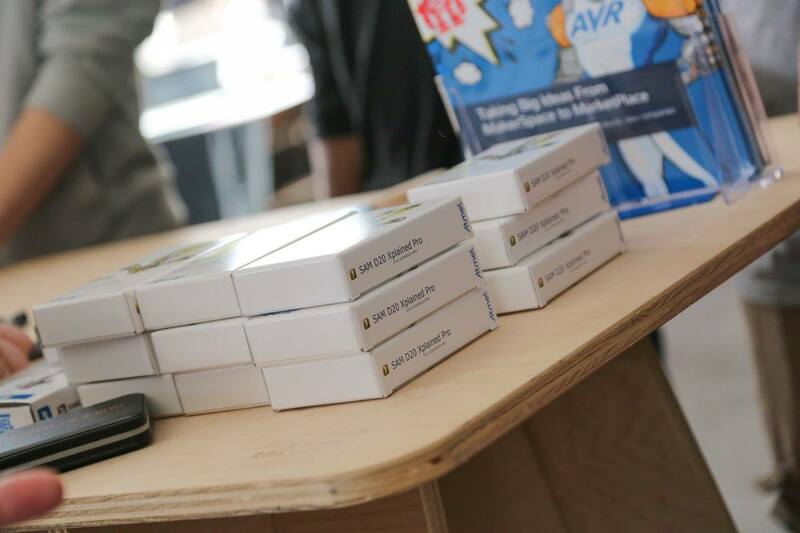 In case you missed them at Maker Faire Bay Area 2015, 1Sheeld magically transforms your smartphone into one of 40 different reconfigurable Arduino shields. 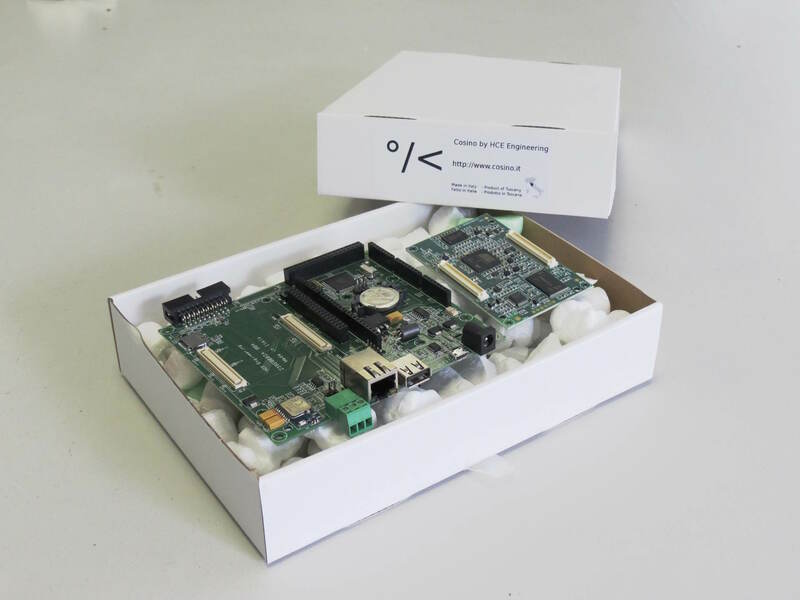 Cosino is an open source platform comprised of flexible, easy to-use hardware and software components. The team will be showing off their latest projects based on the Cosino (SAM9G35) and Cosino Enigma (SAMA5D3) CPU modules along with their carrier boards and other GNU/Linux embedded systems. Everyone’s favorite teenage CEO and whiz kid, Quin Etynre will once again be on hand with Qtechknow’s Arduino-compatible board, the Qduino Mini. But that’s not all, you’ll even be able to snap a black and white selfie in his thermal printer photo booth! 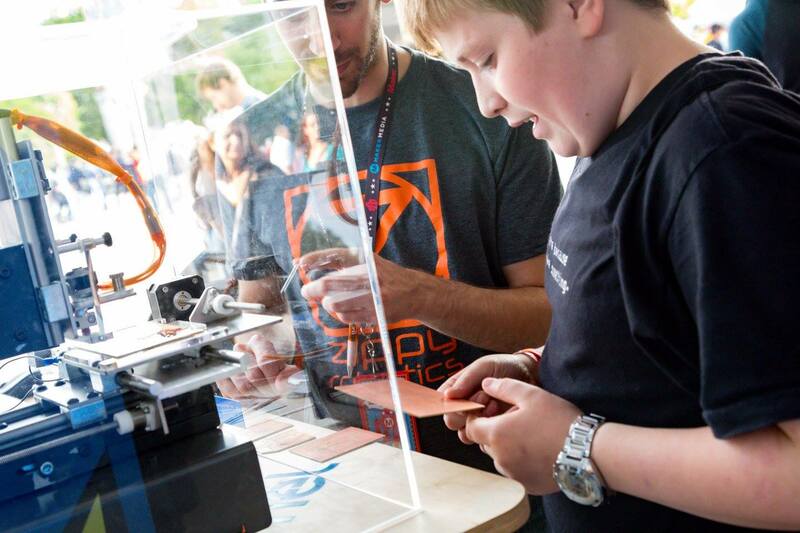 Heck, even major brands are tapping into the powers of the Maker Movement! Escaping dangerous dark or smoke-filled structures quickly is crucial for the firefighters who save thousands of lives on a daily basis. 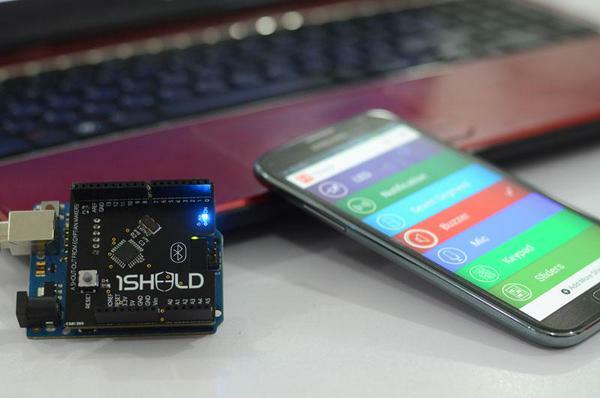 Tailored for those situations, Bosch will be demonstrating a prototype of their indoor navigation device that’s built around the mighty Arduino and BNO055. 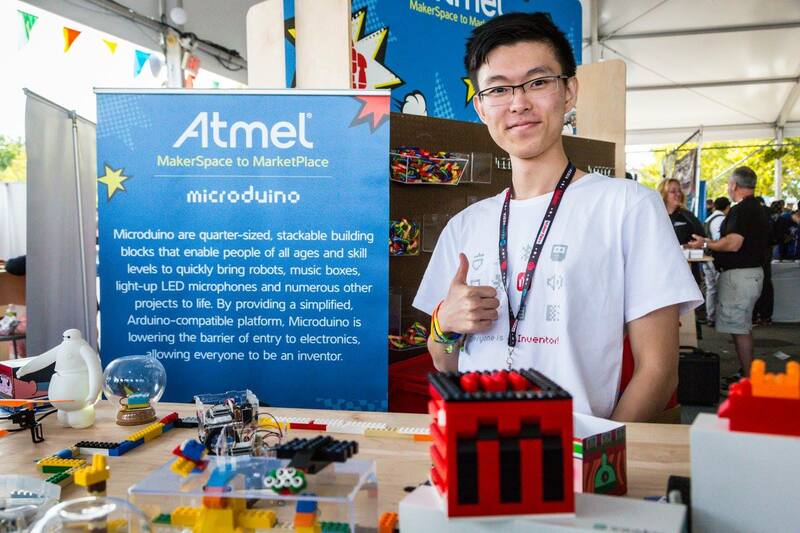 This entry was posted in Events and tagged 1Sheeld, ACME Systems, Arduboy, Arduino, Arietta G25, Atmel, Bosch, Cosino, Intoino, Maker Faire, Maker Faire Rome, Qtechknow on October 15, 2015 by The Atmel Team. 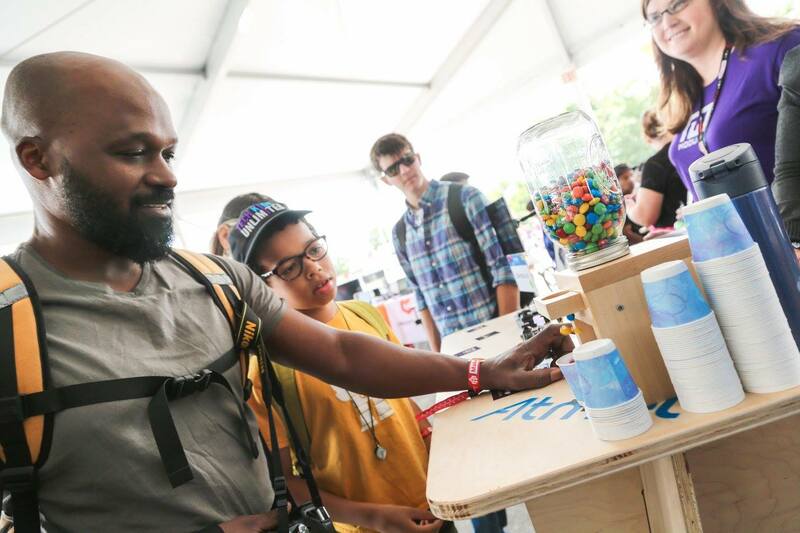 Maker Faire New York, Maker Faire New York — a show (and tell) so good we had to say it twice. 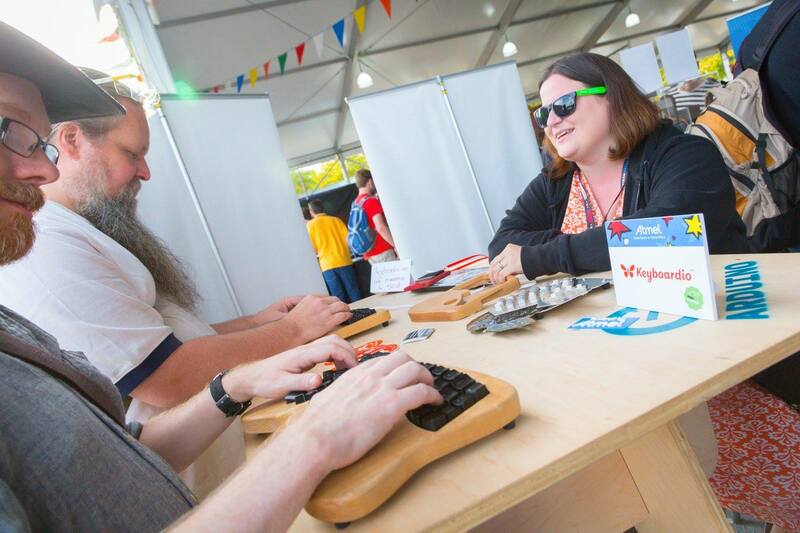 Ah, Maker Faire. The only place that can you find everything from a 30-foot-tall, flame-throwing robot and a life-sized game of Mousetrap to a pancake printing machine and a floating head choir that sings when you press their keys. 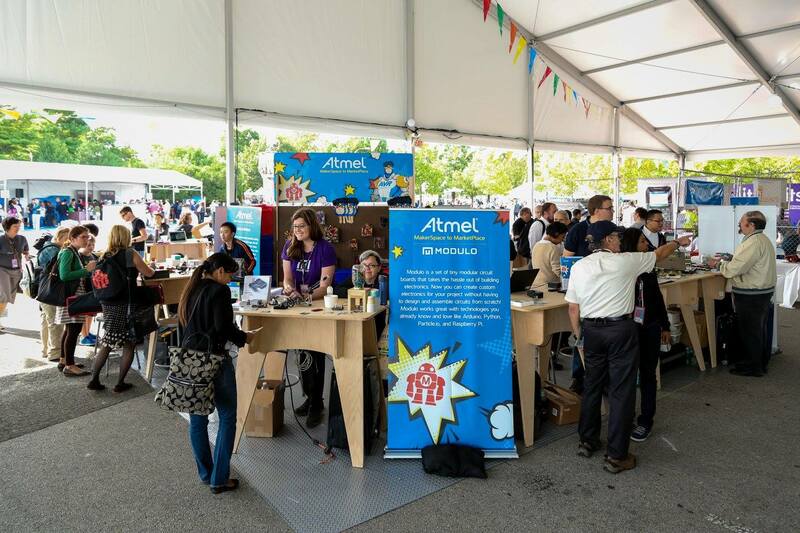 Over the weekend of September 26th and 27th, tinkerers, modders and hackers of all ages flocked a jam-packed Atmel booth housed inside the always popular Maker Pavilion. 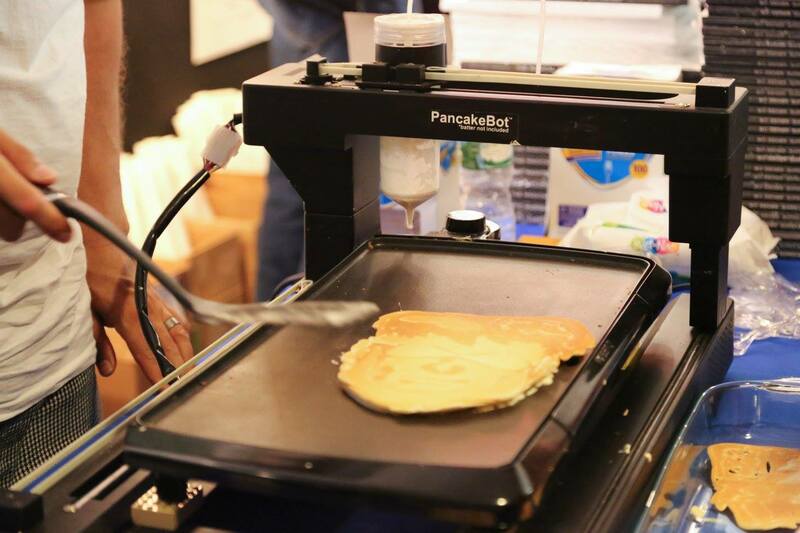 There, we showcased a number of gizmos and gadgets that have successfully made its way “From the MakerSpace to the MarketPlace.” Meaning, this particular batch of startups have demonstrated what it takes to bring an idea from mere prototype to full-blown product, many by way of crowdfunding. Among those on display included the Kickstarter sensation and wrist-friendly Keyboardio, the credit-card sized gaming system Arduboy, 14-year-old Quin Etnyre and his Qduino Mini, former Pixar engineer Erin Thompson’s Modulo boards, Microduino’s super LEGO-like modules, and Zippy Robotics’ soon-to-launch Prometheus PCB milling machine. Oh, and who could forget big names like Bosch, Arduino and the one-and-only Massimo Banzi, too? 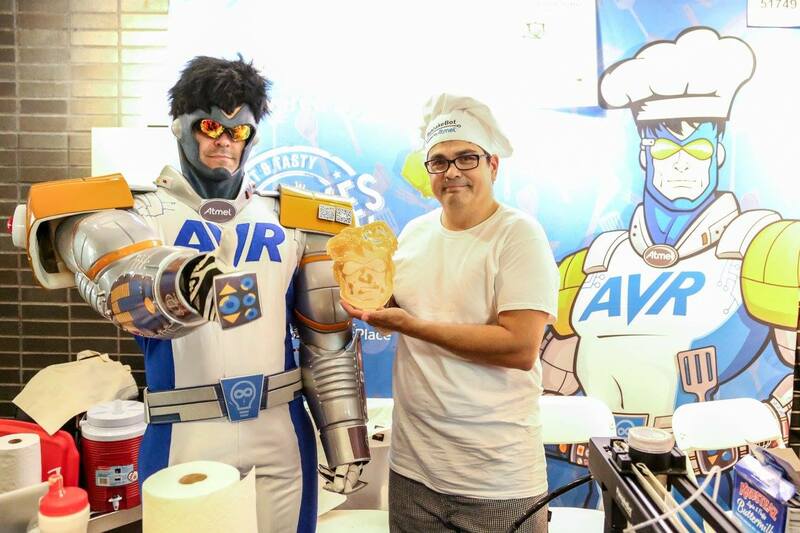 When it came to projects driven by our mighty AVR and Atmel | SMART MCUs, it didn’t stop at our booth either. 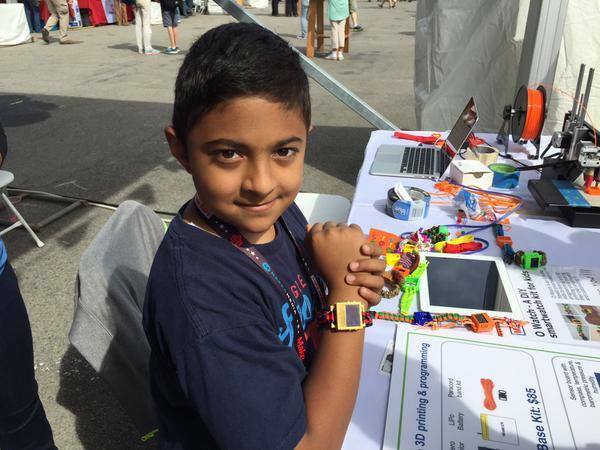 In fact, countless others throughout the fairegrounds proudly showed off their embedded creations, with some of them even paying a special visit to our tent like PancakeBot, Zymbit, Dr.Duino and eight-year-old CEO Omkar Govil-Nair with his Arduino-based O Watch, to name just a few. 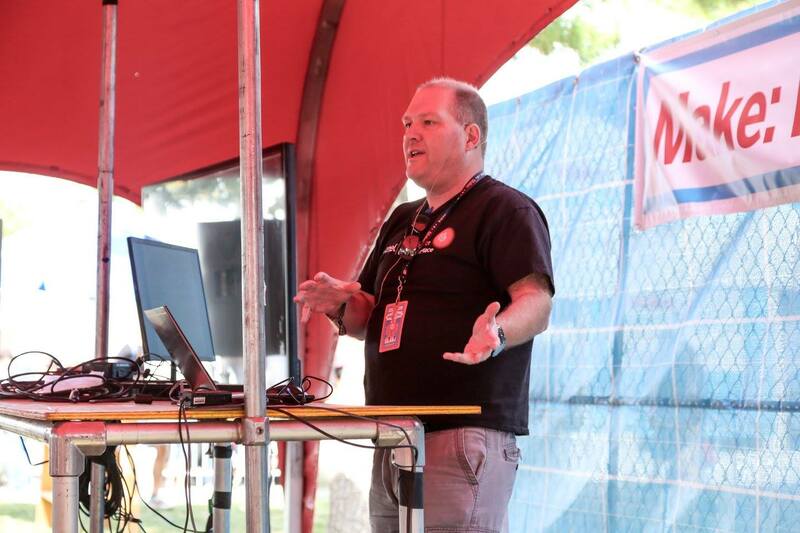 On top of all that, several Atmel team members — Bob Martin, Henrik Flodell, Sander Arts and Artie Beavis — took the World Maker Faire stage to talk prototyping, Arduino, debugging, STEM and how to take your product mainstream. So with another incredible event in the books, let’s take one last look back before flipping the page to Rome! 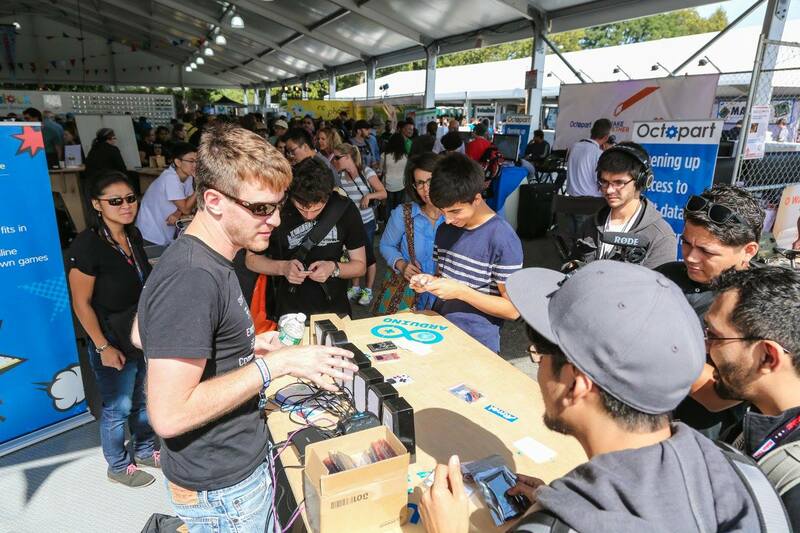 This entry was posted in Events and tagged Arduboy, Arduino, Maker Faire, Maker Faire New York, Maker Faire New York 2015, Massimo Banzi, Microduino, Modulo, O Watch, PancakeBot, Qtechknow, World Maker Faire, Zippy Robotics, Zymbit on October 8, 2015 by The Atmel Team. The Qduino Mini is an ATmega32U4 based board with a built-in battery charger and fuel gauge that’s just as affordable as an Arduino, but a quarter of the size. Hot on the heels of a rather successful Kickstarter campaign, Quin Etynre continues to amaze us with his pure ingenuity and passion for creating things. As the quintessential example of what it takes to go from ‘MakerSpace to Marketplace,’ earlier this year the 14-year-old CEO introduced what he calls the Qduino Mini — a tiny Arduino-compatible board equipped with a built-in battery charger and fuel gauge that can let a user know when their LiPo needs a little more juice. Born out of his own frustrations of having to guess when a project was running out of power, the open source dev board is based on an ATmega32U4 — the same MCU that can be found at the heart of the Arduino Leonardo, which the Maker has used to tinker around with for quite awhile. The small device isn’t only packed with a charger circuit and fuel gauge, but possesses a lightweight, ultra-thin form factor as well. This allows for it to be programmed and have its energy restored simulatenously via USB. On top of all that, each Qduino is also breadboard-friendly and has two RGB LEDs: one for status, another that’s user programmable! The Qduino Mini measures just 0.8″ x 1.5” in size and weighs a mere fraction of an ounce, making the shrunken down Arduino ideal for drones and high-altitude balloon projects, as well as a wide range of other gadgets like Etnyre’s incredibly popular B&W Photo Booth that had been on display inside our Maker Faire New York booth. 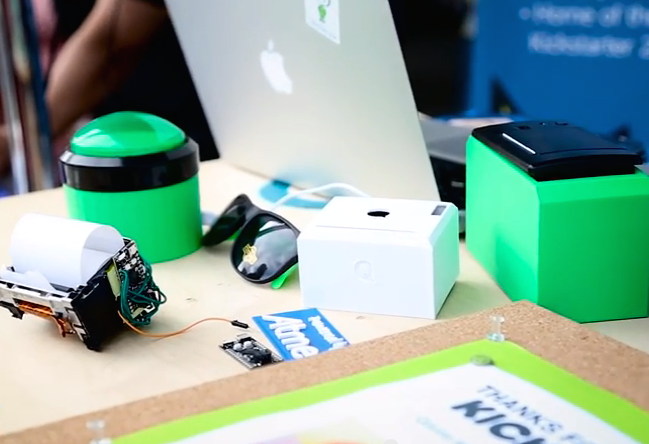 The system itself is comprised of a monitor and two green 3D-printed parts: a button and a thermal printer, both embedded with an Qduino Mini. Pressing the round button triggers a sketch, which in turn, processes the captured image from the webcam and sends it over to the thermal printer. Pretty cool, right? But don’t just take it from us. Watch Etnyre explain it himself in the video below! 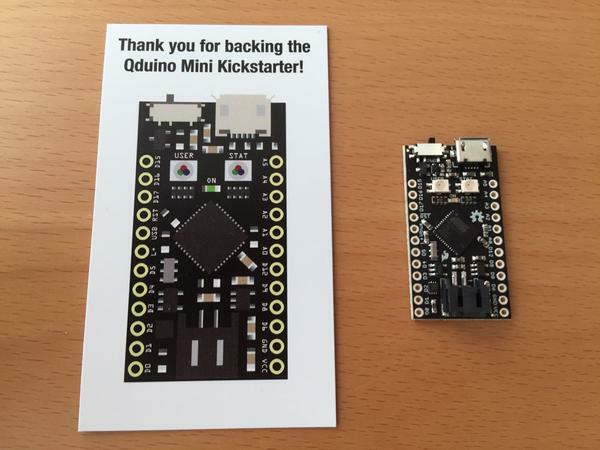 Plus, those wishing to pre-order a Qduino Mini of their own can now do so over on SparkFun. This entry was posted in Arduino-Compatible, Events, Maker Movement and tagged Arduino, ATmega32U4, Kickstarter, Maker Faire, Qduino Mini, Qtechknow, Quin Etnyre, Thermal Printer, Thermal Selfies on October 5, 2015 by The Atmel Team. Heading to the New York Hall of Science this weekend? You’ll find some big names inside the Atmel booth. Are you excited? We sure are! 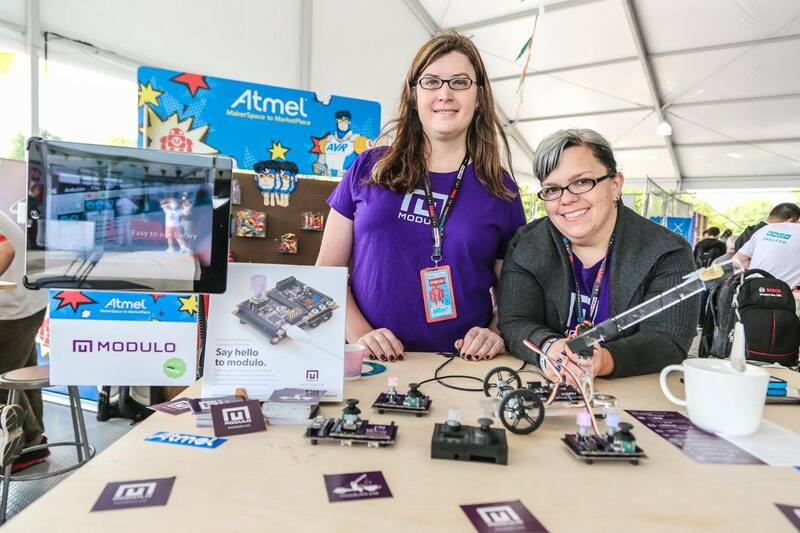 Atmel is getting ready to take center stage at the 6th Annual World Maker Faire in New York City this weekend, September 26th and 27th. And boy, are we in for a treat! 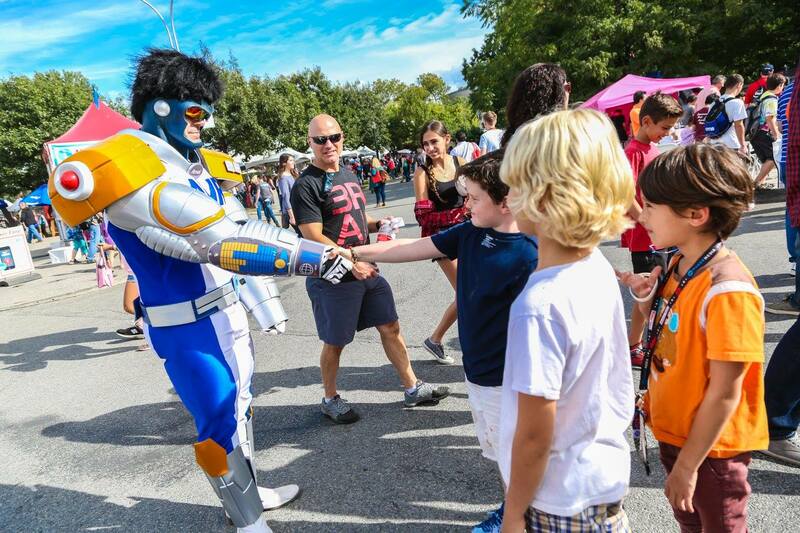 This year will surely be yet another amazing event with more than 830 Makers and 85,000 attendees expected to flock the New York Hall of Science. Once again, as a Silversmith Sponsor of the show, we’ll be shining the spotlight on a wide range of AVR and Atmel | SMART powered projects inside our booth. 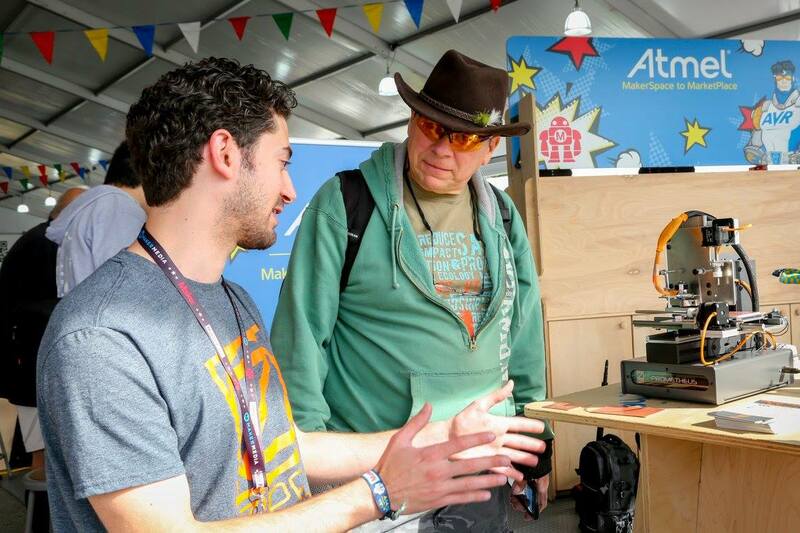 Found at the heart of the Maker community, Arduino is an open-source electronics platform based on easy-to-use hardware and software. 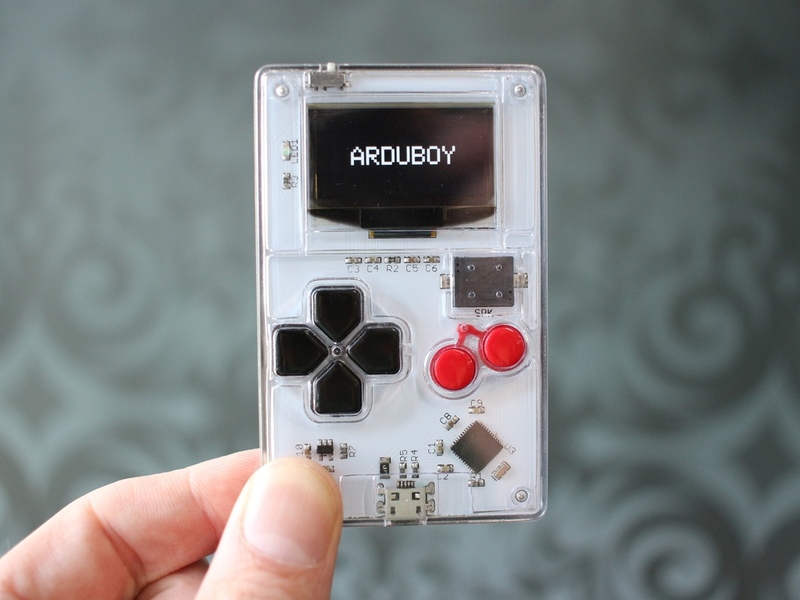 Arduboy is an open source, credit card-sized device for people to play, create and share their favorite 8-bit games. 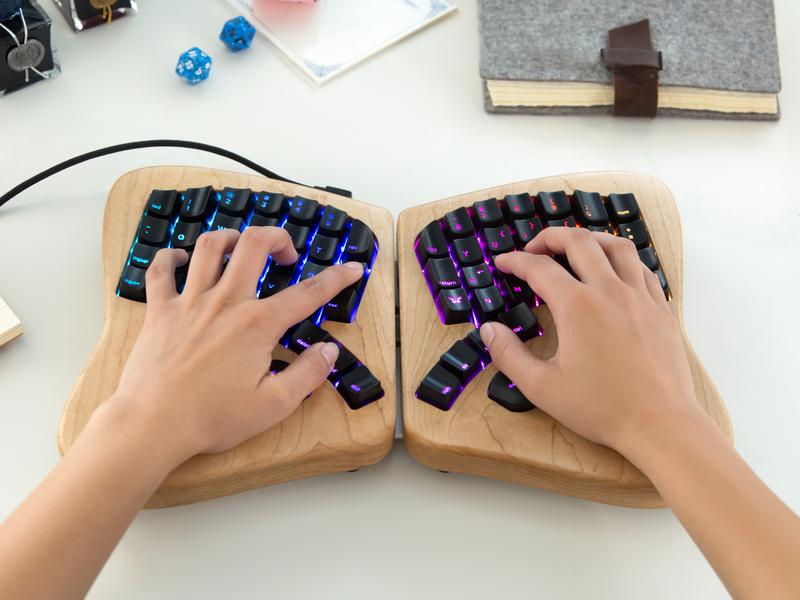 Keyboardio‘s Model 01 is an heirloom-grade keyboard for serious typists, which features a beautiful hardwood body, an advanced ergonomic design, and is fully programmable with the Arduino IDE. Microduino are quarter-sized, stackable building blocks that allow Makers of all ages and skill levels to bring robots, music boxes and countless other projects to life. 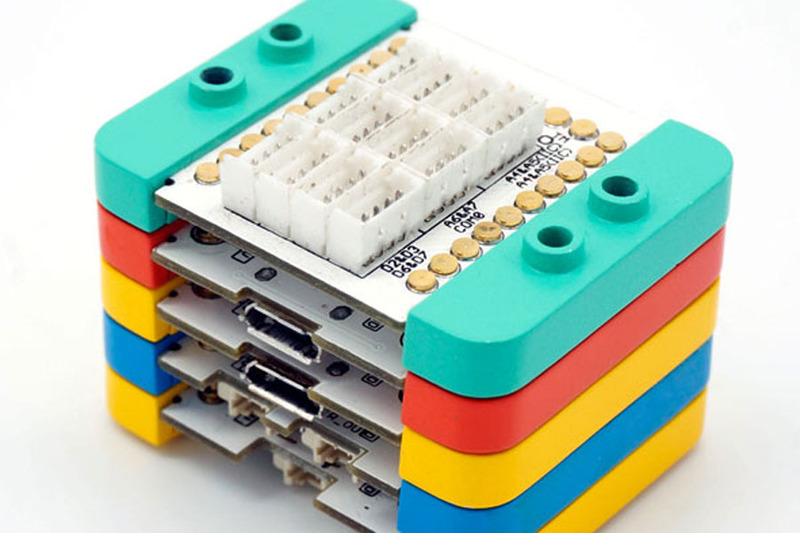 Modulo is a set of tiny modular boards that takes the hassle out of building electronics, giving Makers the ability to develop custom electronics for their project without having to design and assemble circuits from scratch. 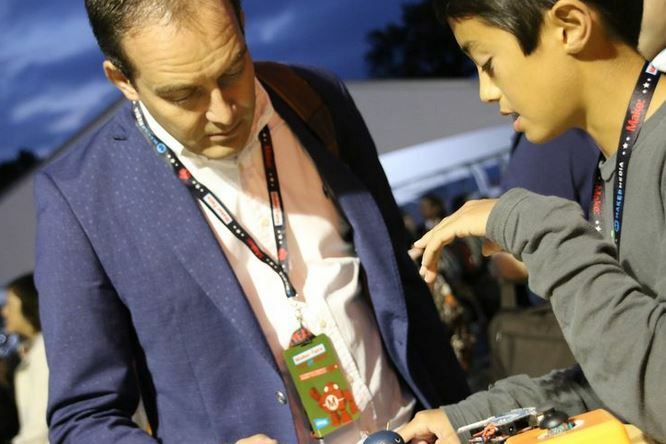 Quin Etnyre is a 14-year-old Maker, teacher and entrepreneur, who fell in love with Arduino after attending his first Maker Faire at the age of 10. The whiz kid recently successfully funded his Qduino Mini, an Arduino-compatible tiny board with a built-in battery charger and monitor. 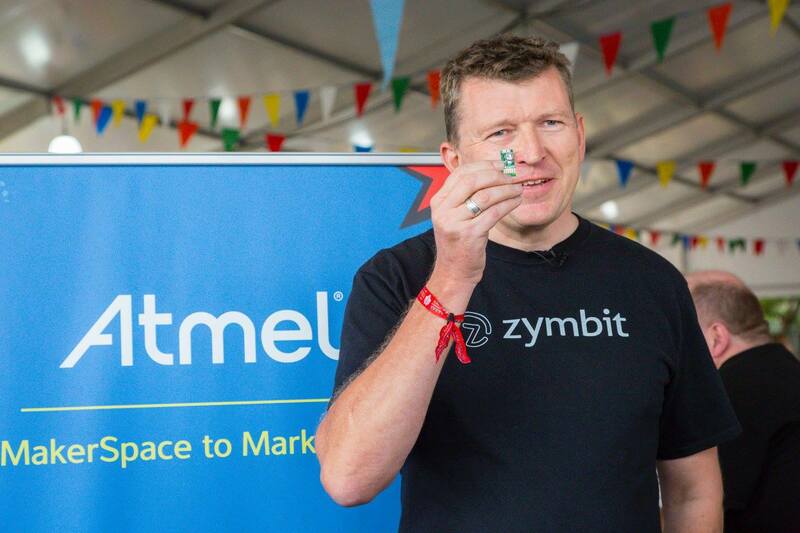 Prometheus from Zippy Robotics lets Makers create real circuit board right from their desktop in just minutes. Bosch Sensotec has developed a prototype indoor navigation device based on Arduino and the BNO055 sensor, which will enable firefighters to quickly escape from dangerous dark or smoke-filled structures. 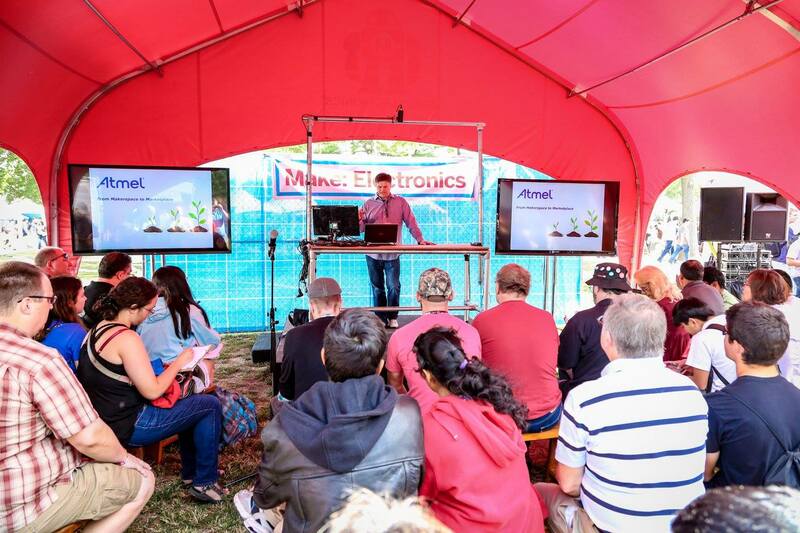 Don’t miss Atmel’s Henrik Flodell as he explores the ways to Take Your Arduino Prototype to the Next Level on Saturday from 11:00am-11:30am on the MAKE: Electronics stage. 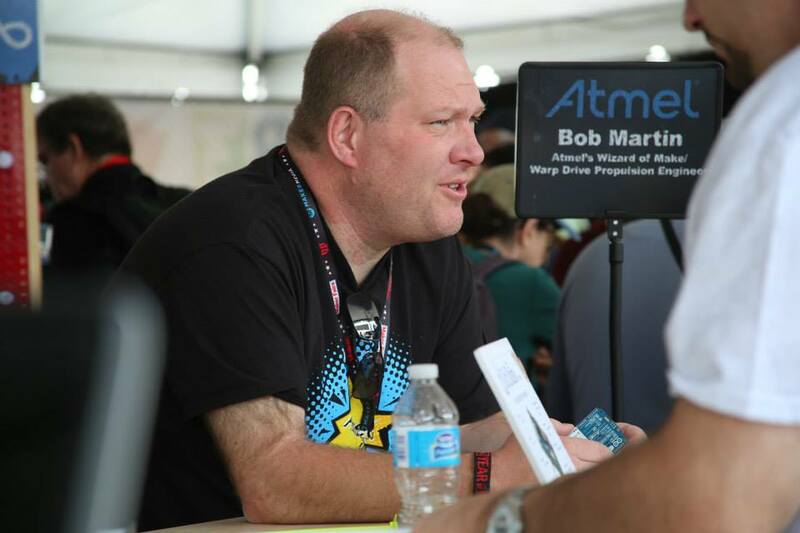 He will be immediately followed by the Wizard of Make Bob Martin who will demonstrate how to Stretch Your Arduino Environment to Get the Visibility You Need. 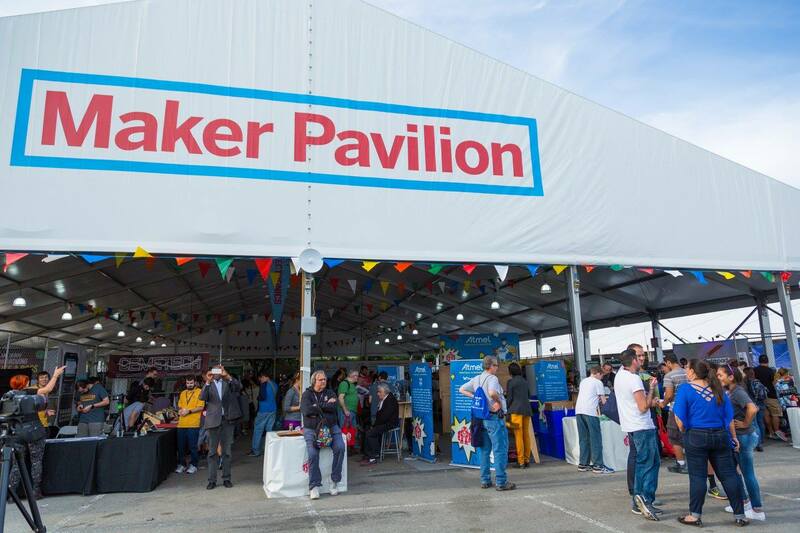 On Sunday, Atmel VP of Marketing Sander Arts will hop on the MAKE: Electronics stage at 11:30am to reveal how Makers with an entrepreneurial spirit can Turn Their Prototype Into a Business. 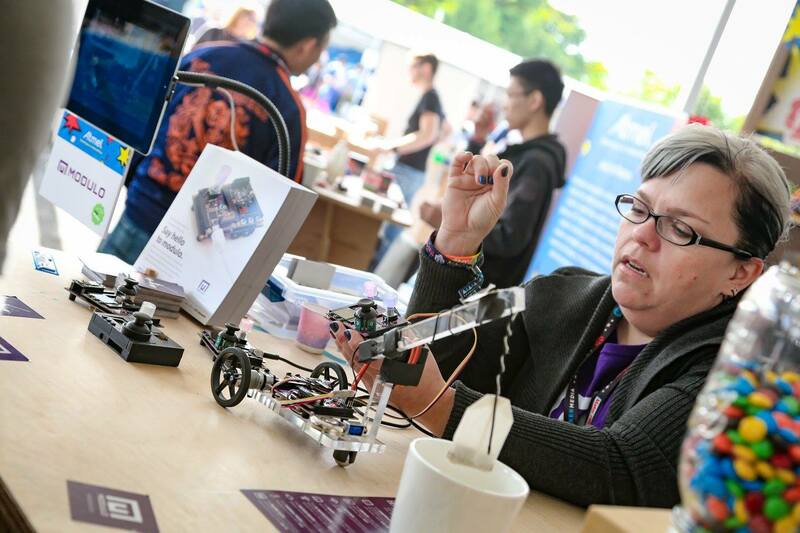 Several hours later at 4:00pm, Atmel Head of Social Media Artie Beavis will moderate a lively discussion between Bob Martin, 14-year-old CEO Quin Etnyre, Arduino’s Tom Igoe and Dr. Michael Wang on the ways Arduino Opens New Doors for Educators and Students. You don’t have to be a reader of EDN.com to enjoy a unique meet-up hosted by the site’s LEDitor-in-Chief Lee Goldberg, which will taking place on Saturday 10:30am. The VIP walking tour will take you backstage several of the event’s most interesting exhibits, namely Atmel. 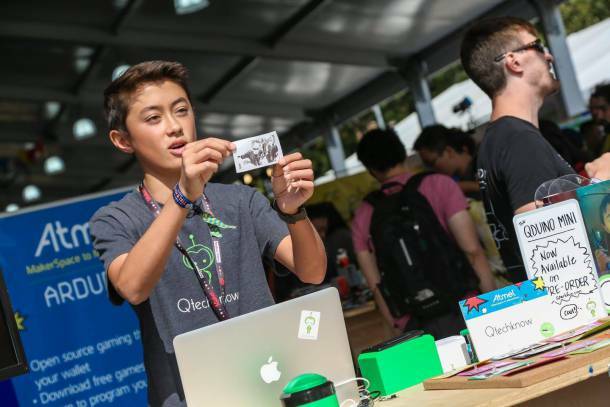 You’ll also walk away with tons of t-shirts, evaluation kits and lots of other cool swag. Those wishing to participate are encouraged to meet in front of the rocket-shaped “Forms in Transit” sculpture, located at the traffic circle that’s just beyond the main entrance. The actual tour of the Faire grounds will kick off at 11:00am sharp! With only 25 spots available, reservations are strongly recommended. To RSVP, write Lee at LEDitor@green-electronics.com. Can’t ‘make’ it to the Faire? Don’t worry! 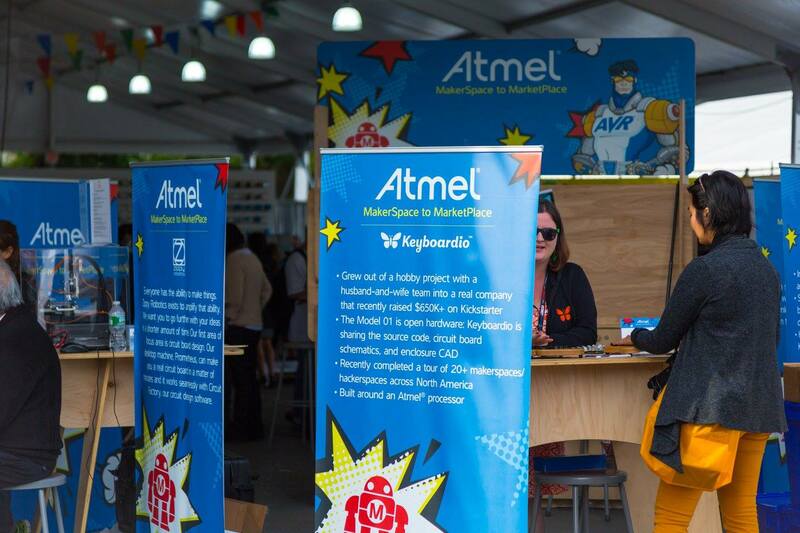 You can always follow @Atmel live on Twitter for the latest updates, trends and happenings. What’s more, we’ll even be bringing the show to you live via Periscope. Stay tuned! 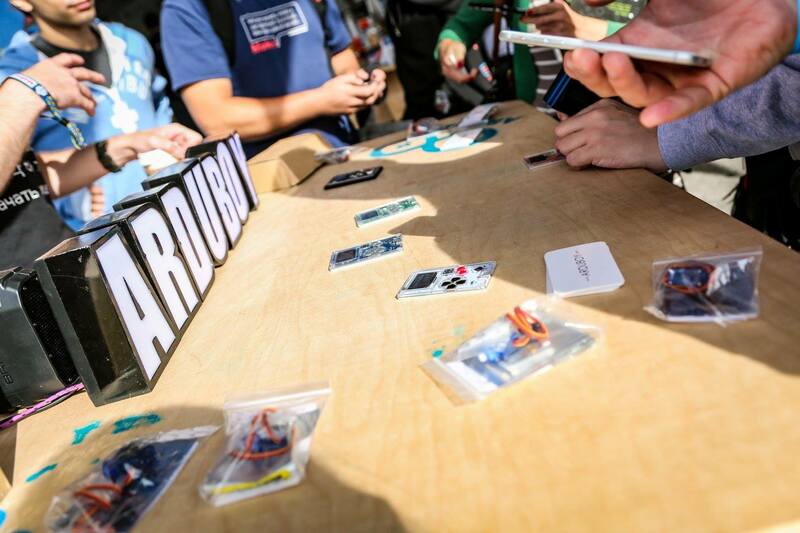 This entry was posted in Events and tagged Arduboy, Arduino, Artie Beavis, Bob Martin, Bosch, Henrik Flodell, Maker Faire, Maker Faire 2015, Maker Faire New York, Microduino, Modulo, Qtechknow, Sander Arts, World Maker Faire, Zippy Robotics on September 23, 2015 by The Atmel Team. 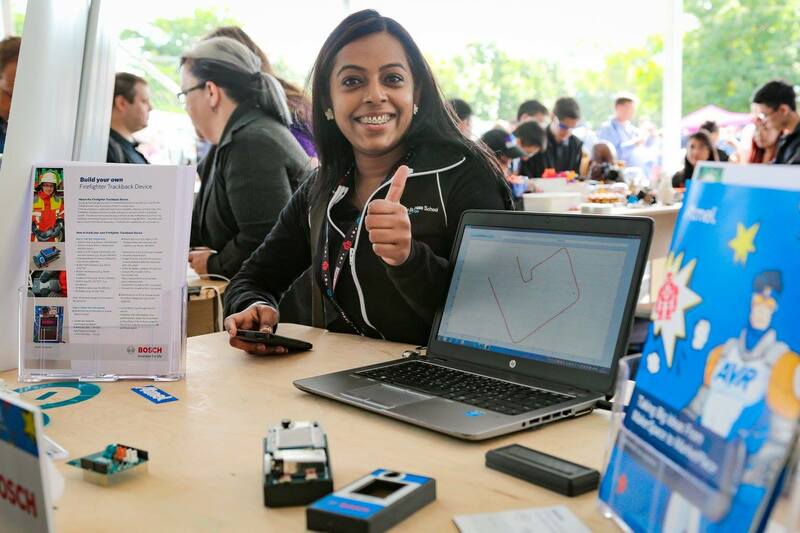 With Maker Week now underway, Atmel is getting ready to take center stage at the Maker Faire New York on September 26-27th. 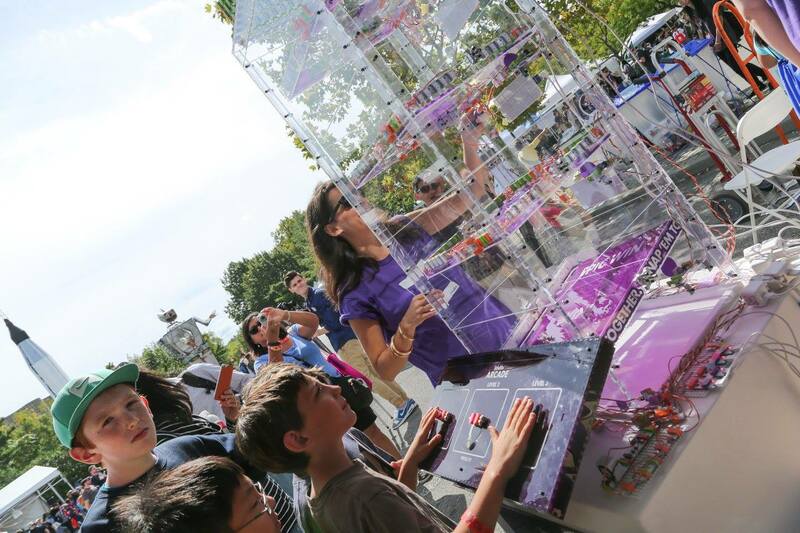 Undoubtedly, this year will yet again be amazing as an expected 830+ Makers and 85,000+ attendees head to the New York Hall of Science to see the latest DIY gizmos and gadgets, as well as AVR Man in the flesh. 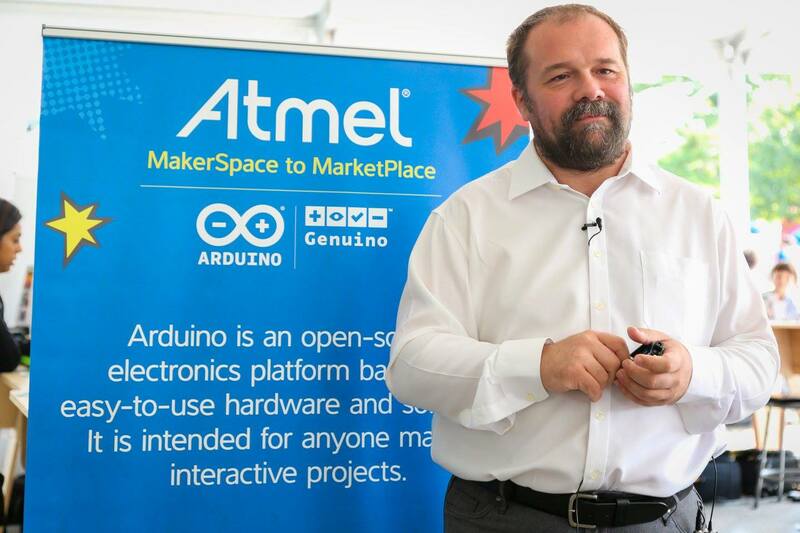 Once again a Silversmith Sponsor of the event, Atmel will be shining the spotlight on Arduino and a range of other Maker Movement-driven startups. Among the names you will find inside our booth include Arduboy, Keyboardio, Qtechknow, Microduino, Modulo, Zippy Robotics and Bosch. 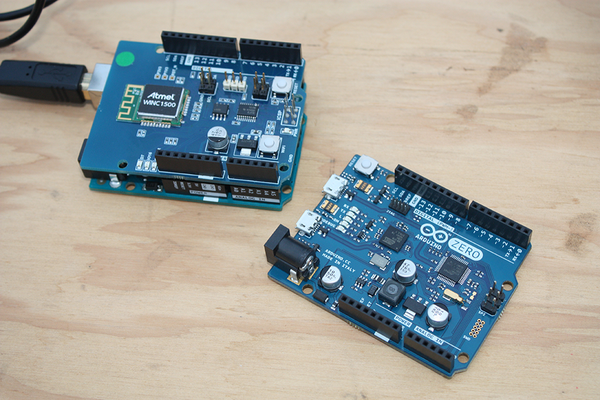 If you’re lucky, you might even be able to walk away with an Arduino shield and adapter board, along with some other flair. Ah… there’s just so much to show and tell! 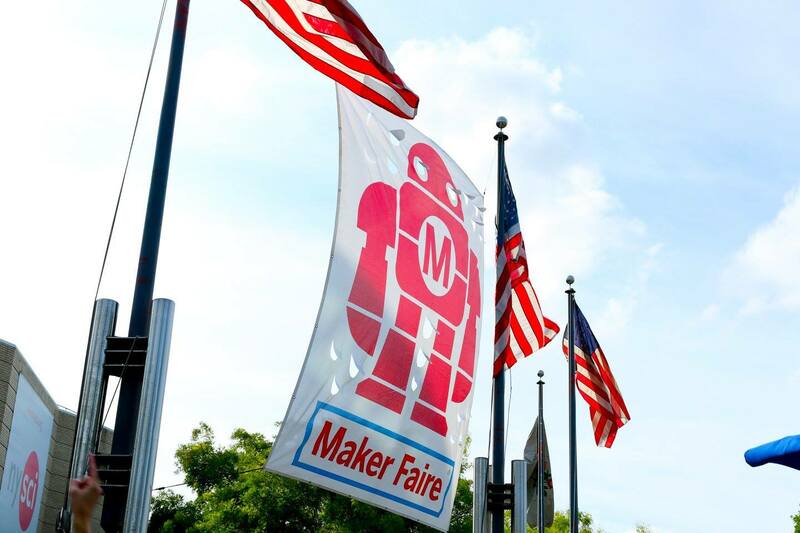 And with the final countdown to Maker Faire on, what better way to capture and convey all those emotions than with these GIFs? When you realize that Maker Faire is only days away. When you wake up on the morning of the show. When you get stuck in traffic en route to the New York Hall of Science. When you spot the faire grounds entrance in the distance. When you finally make it through the ticket line and entry gate. When Arduino announces a new Atmel powered board. When you see a 3D printer in action for the very first time. When someone stops by your demo. When people can’t stop talking about your project. When you are given free sample kits. When you realize there’s just so much to see. Where to even begin? When you spot Massimo Banzi. 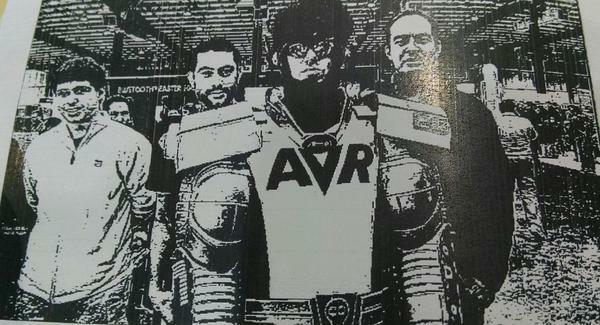 When… wait a minute… is that AVR Man? When you come across a life-sized game of Mouse Trap. When you proudly show off your new swag. When you see a fellow Maker dressed in Steampunk. When you’re inspired to go launch a Kickstarter campaign. When you appear in MAKE: Magazine. When you receive an Editor’s Choice Ribbon. When you realize the end of the day is near. When you remember there’s still Sunday. When you’re surprised by the heat of a 69-foot-tall fire-breathing dragon. When you can’t take your eyes off of the Coke Zero and Mentos demo. When you arrive at the unbelievably long line for lunch. When you can’t pronounce a project’s name. When you prepare to do battle in the Game of Drones. When you control an object with your mind. When you learn a eight-year-old was the mastermind behind that project. When the “State of Arduino” address is about to begin. When you meet new Maker friends. When the Power Racing Series brings your Mario Kart dream to life. When a panel discussion sparks your curiosity. When you find out that an Atmel chip is inside that gadget. When you realize that Maker Faire is really coming to an end. When you finally get home after an eventful weekend of making. See you all in New York! For those unable to attend, don’t fret. 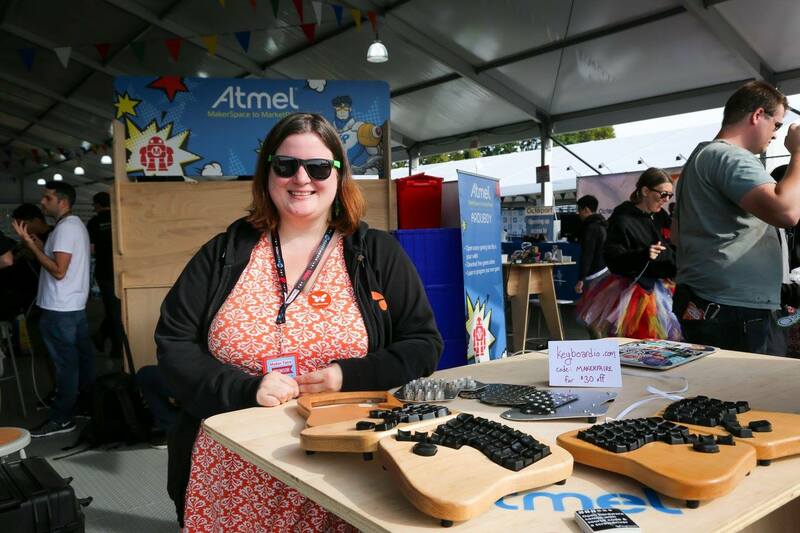 Simply follow @Atmel on Twitter for all the latest happenings from the Faire. 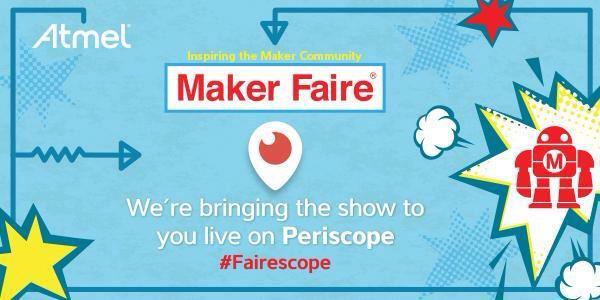 We’ll even be streaming some of it live to you via Periscope Fairescope! 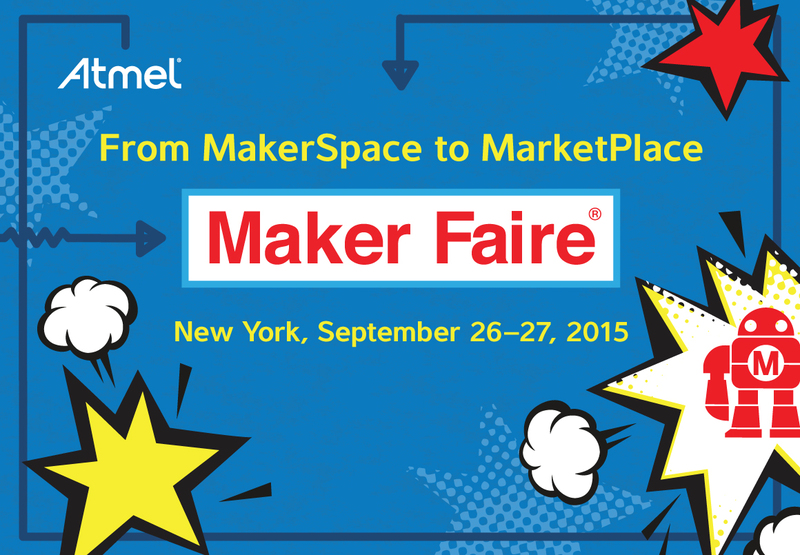 This entry was posted in Arduino, Events, Maker Movement and tagged DIY, DIYers, GIFs, hobbyists, Make (magazine), Maker Faire, Maker Faire GIFs, Maker Faire New York, Maker Movement GIFs, Makers, World Maker Faire on September 22, 2015 by The Atmel Team.